I would say let's just crop the same way we've done in the past. Try to crop at the existing edges if we can, and remember to try minimizing the length of the line we're cropping so there's fewer edges to repair. We would make a cropping proposal map to see if people are ok with the cropping plan like in the past. 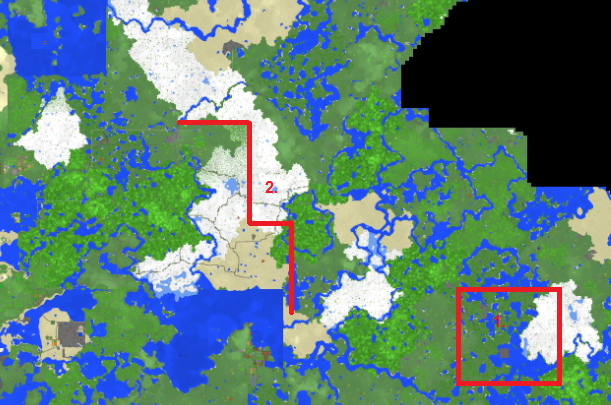 but with 1.7's new biomes and almost no oceans, we should just crop, say, 300 meters from claimed land. If we add 300 meters the edge will be longer and harder to repair. I would say at most 200 meters, you can only see around 160 meters anyway, but I would make that a general rule and not follow it very strictly, so that the cropping edge will be as short as possible. was there a rough estimate oh when it was going to be out? edit: is this suppose to come out in 1 month but will come out in 3, or will this really come out in 1 month? The 1.7 full release is coming up pretty fast and while I know we have to wait for the bukkit update, here is my cropping proposal for my area. I think we should keep the part of the peninsula area with the village up to the river, but Fiah may differ on the specifics. I don't know what he wants to do with the area further east though. Edit: Yqt said that he and Bla have tons of school stuff this week, so there won't be any cropping for now. Remember that cropping can only be done chunkwise, so it will be impossible to follow a river like that. Anyway, here is my cropping proposal for the entire overworld. I tried to follow your plan around your regions. Given that I think everyone is very excited about the new terrain, I have tried to be a bit stalinent?? (the opposite of leninent?) with the cropping, in other words, I have even cropped out some parts that I left there in previous cropping, such as northern Vatallus. I have marked some areas that I am unsure about in yellow, and feedback from people active in those areas would be useful. 1: Here I saw some circles on the map that were clearly player-made, I think in stone material. I guess stuffhappens might be the one responsible for them. I judged that they weren't important enough to preserve, so I plan to crop them, but I may be wrong, I could tp there I guess. If someone could inform/ask stuffhappens, that'd be useful, I don't really know any way I can contact him and he's rarely online. 2: This island had a ravine that I think Ventus, Mudkipz, possibly Darvince, Atomic and maybe Yqt explored long ago, and a camp in the ravine, but besides from that I don't think the island has anything special and that it has been abandoned for a long time, so I suggest that we just get rid of it now. If those who explored it want it to be preserved, say so. 3: Northern Vatallus. The decision of whether to preserve this area which includes a town is up to Mudkipz. 4: This area has the UBSR resource station I used as base for digging desert and stuff in October and the area includes the skyrail segments outside the red. Yqt wanted the skyrail demolished and my plan is to get on sometime soon and remove it so that we can just crop the area. 5: This desert, I built a road through it to the old Rossjungles and it had a village that I think is now dead... I liked the road a bit but it's not a big deal. It doesn't seem like anyone cares about the area anymore, anyway it's closest to Fiah so he should complain if he wants it to stay. 6: Quontex's settlement on the new quontinent he discovered long ago, this time I plan to just preserve the settlement and move it to near Quontia, since when he comes online I guess he'll be more excited about exploring post-1.7 terrain anyway. He probably won't have access to com to respond to this but if he really wants the entire island preserved I guess I could paste it back from a backup later. 7: Mystic Marsh I suggest be moved to the swamp near UYP and Mount Olympus, that Mudkipz built a road through. It seems like the most natural place to put it because of the biomes rather than having it spawn in the middle of whatever terrain will generate there after the crop. 8: Quontex's mushroom island I plan to move near Quontia, again because there probably will not even be an ocean around it after the crop. So discuss. And I don't know how much time I'll have to crop it in the weekend, but I think I might have time. The math for next week is pretty easy and already mostly done, but on Saturday I have promised to help our local Unity List with putting up some election posters and spreading some election flyers around where I live, so Idk yet. The sooner people comment and agree, the earlier I can start working on the cropping. Edit: Decided to shave some more land off Swamphold Swamp, down to the orange area instead. I think even more of it can be cropped actually, the ocean there is big, but I would have to be careful with the stronghold. I also visited that island at the same time as the others, and I think that was before yqt joined. It was ages ago, way back to last year. Edit in response to b_ong: Yeah, kipz has a mining center in that area somewhere. No idea about the area in box 1, however the ice island doesn't have anything important as far as I know. We did make an outpost up there, but I don't think anybody has used that or been over there since, not recently anyway. To Blotz 2: There is still plenty of ocean, look around Mudkipz's farms, the area east of Azecliffs, a lot of ocean around smjjames' settlements and Fiah too, and Matolony. I don't think it's worth preserving. To Mudkipz, I assume that means you want it preserved, that'll be a lot easier than moving it, so the new cropping plan includes it in preserving region below. I inspected the stone circles to the north and this is how they look. I plan to crop them and if someone is missing them I'll just refund the materials. I also just mined the rails from UBSR resource post (and looted chests there etc.) to Kaministiquia's jungle border. Also, when me and Fiah tried to look for the third stronghold, the eyes of ender kept centering roughly along the northern shoreline of the lake north of that desert ghost town, so might want to bump the red line a chunk or two north there to be sure that the end portal does spawn. You (or Yqt) can check on that in single player or something. Of course though, that IS technically Quontexes land, which is co-owned by Bla I believe. 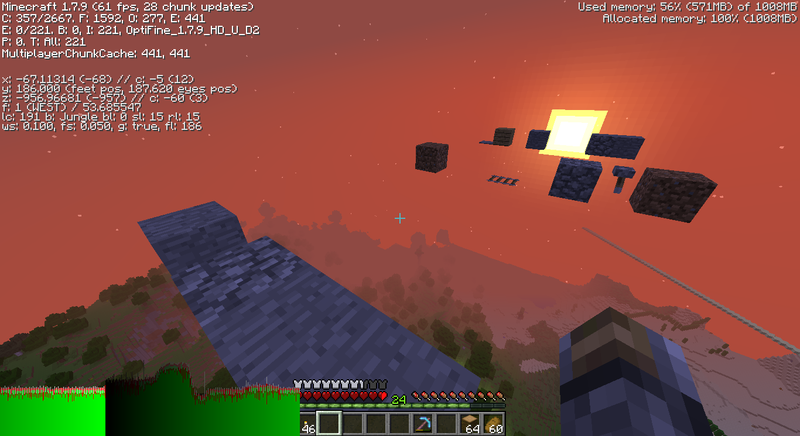 We're changing the seed so the previous eyes of ender won't apply. Good point. Do you know the max distance from the map center the strongholds spawn? I think it might be 3km or something. wait so thre will be 3 more strongholds right? it's possible that there will be 3 more strongholds, however most likely there will be 1 more or none at all. Unless the distance at which the strongholds spawn was changed, it's technically impossible for a new stronghold to spawn without cropping one of the abandoned/inactive areas. and gave the seed away-didn't everyone delete it? and also nothing has happened so?? "There is a limit of three strongholds per world. 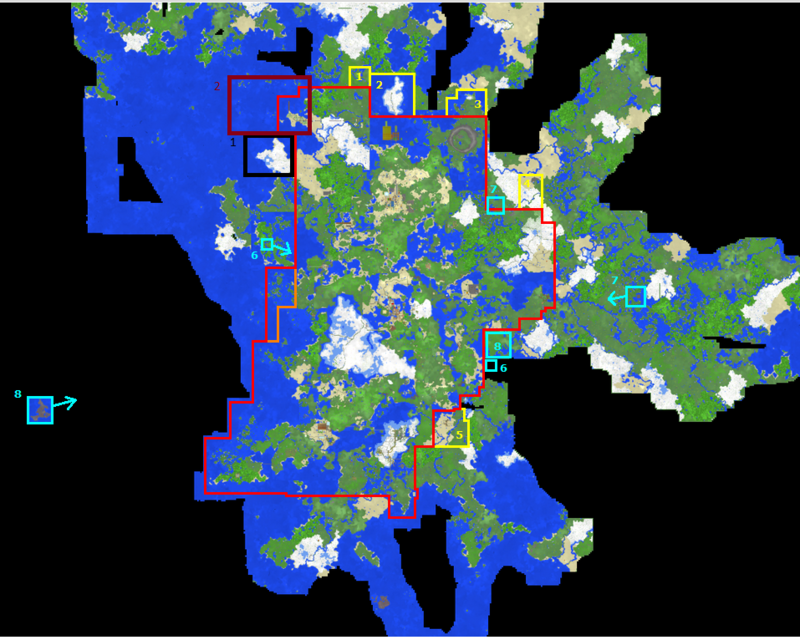 All strongholds are located at random positions in a radius between 640 and 1152 blocks from the world's original spawn point, at 0/0 (but may extend further in or out of that area). The three strongholds are spawned at roughly equal angles from the center point of the world (that is, each stronghold is in the region of 120 degrees from the others, measured from the origin). The game will not generate a stronghold partially above-ground: any portion above the ground layer will be replaced with air blocks, leaving a cutaway." Blotz, chunky borders aren't the reason why we change the seed, they just mean that there is simply no reason to keep the old one and I can't verify that people actually deleted the old seed so don't ask me if everyone did it. @bla about bong: i remember that he wanted to build farms like forssa out there with the base on those islands which he called ijky islands. Ok, the new official cropping plan is this. The area with Mystic Marsh is a bit big and I'd prefer if it were smaller but I guess it'll work. The deadline for complaints is 22 hours from now. And yes I moved some posts and merged some topics. everything outside of red is cropped except for moving light-blue stuff? Everything outside the red lines are being cropped except for the bits circled in blue which are getting moved to the area of Molten. Although I think the parts that are in orange are bits that Bla is going to crop to instead of the red line. The parts in yellow were just areas Bla wasn't sure about. As for the stronghold, there is a chance it could spawn in the area to the west and north of swamphold. I believe the swamphold fort is 600 or 800 blocks from spawntown, so there is some room for it over there. As for the final cropping plan, it looks good to me. Just a thought, shouldn't the area where square 6 is being moved to be explored a bit? Not sure if it matters. It doesn't matter, because if we explored the area it would be cropped anyway according to the plan. No point in exploring something we delete anyway. Everything outside the red line will be cropped, and the orange line was just a quick fix I made, the plan is to crop what is outside of it, so here is the same plan. Cyan will be moved. Idk how long the transition will take, but I guess it would be too big a mess to set up a temporary map, if you want to have temporary fun, I'll recommend playing on our temporary 1.7 snapshot world on Multiplay, that I'll consider changing to proper 1.7. Perhaps I'll go 'scorched earth' on what was rossjungles since that is getting cropped anyway. 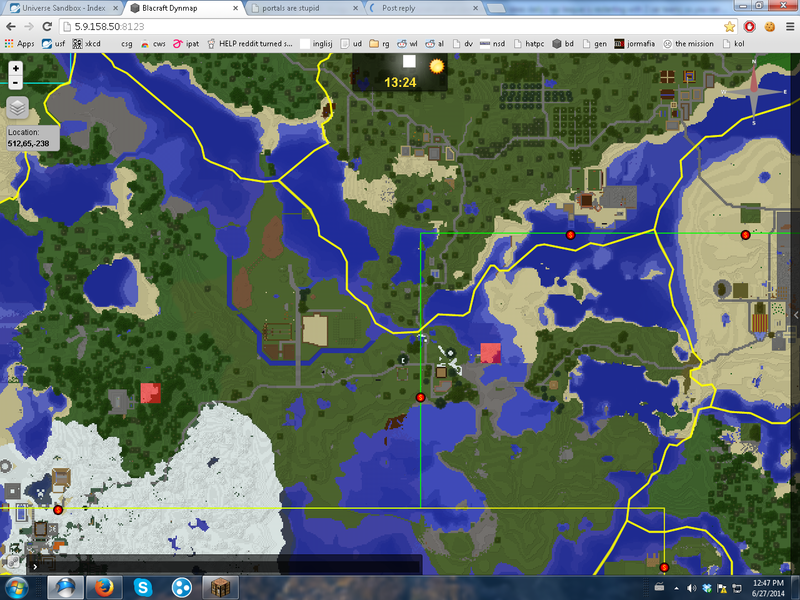 The server is down and I don't recommend playing on it until I get the new map up and ready. I recommend playing on the Multiplay server until then. I have cropped the world mostly according to the plan (I accidentally deleted slightly more land than the plan showed south of Revolutea, sorry Fiah, tell me if you need it MCEdited back in when I upload a map), edited the biomes slightly and changed the seed. Currently I have removed everybody else from the whitelist, because I don't plan to put on a temporary map and I'm currently uploading the cropped world, and I don't want to risk people logging on and loading terrain again with 1.6.4. I'll put the old whitelist back when the server is running Bukkit 1.7, which still seems to be in development. You can mess on the Multiplay server while waiting. 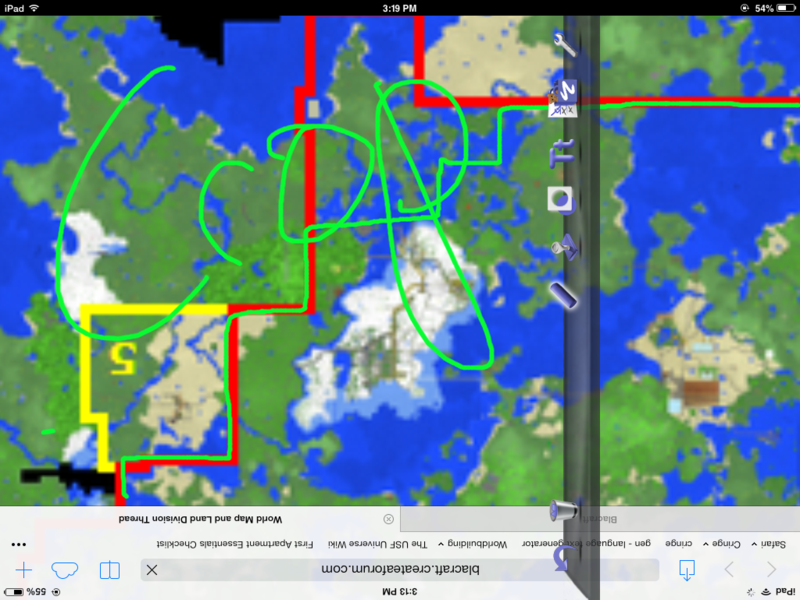 Edit: Done uploading cropped world, verified the new seed is working, also used the structure saver once more to ensure MCEdit or the biome painter shouldn't cause anything to be lost. Now we're just waiting for Bukkit 1.7.
we'd need to crop anyways because of the new "ores"
Yes, we'll probably crop when the update happens, I'll consider how when we get closer to the release so we have a better idea of what areas are developed by then. Hey, could these two chunks be restored to what they were before in the cropping? They're really out of place. I think they generated in 1.6, but I'm not sure. I know there are a couple of those chunks, also one in Zuntriio, and yes, the plan is to restore them, even though I can't promise it. strange blocks found floating above desertopia/deoland border. suspected corruptness?